Bodyguard of Lies 2: Mokole is the second in a series of module/sourcebooks for the Conspiracy X RPG. As usual, the centerpiece of the book is a ready-to-run mission for any Aegis Cell. 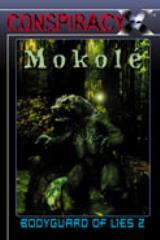 The agents travel to the Louisiana swamps to investigate the truth behind reports of a giant man-alligator called the Mokelé.This cryptozoological adventure includes conspiracies, aliens, the supernatural and a whole lot more. The sourcebook also contains a short story set in the world of Conspiracy X, new traits, trainings and character Credentials, Alchemy Ritual tradition rules and a new look at skills.